A perfect example of how Syncro System meets the requirements of each individual client's needs. This upfit was done by the licensed Syncro System's branch in Calabria – the BNK of Cosenza. 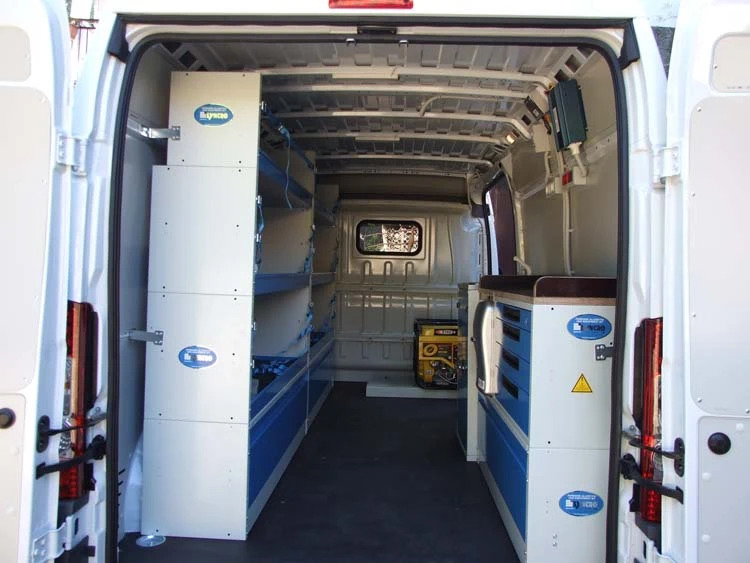 The client does environmental water analysis, and wanted to transform their Fiat Ducato L3 H2 into a mobile workshop, equipped with everything necessary to do chemical testing on site - including specific instrumentation and machinery, plus a refrigerator to keep samples cool. On top of that, the van needed to be self-sufficient energy wise. 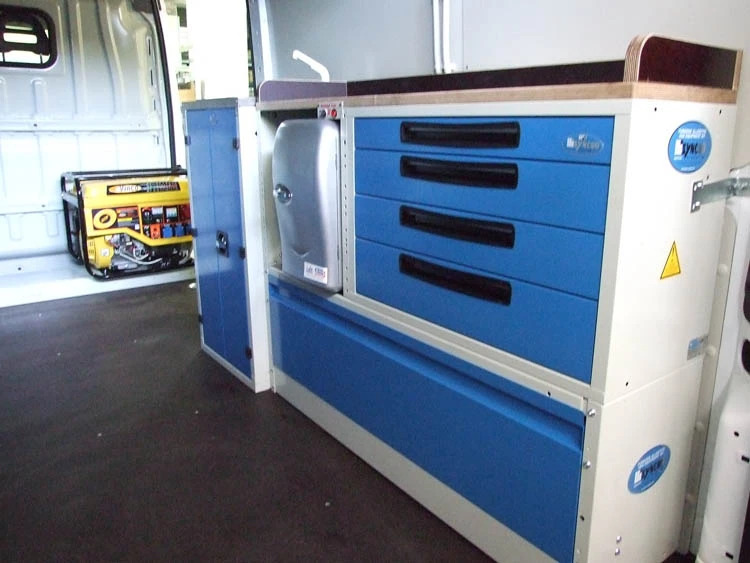 Running water and plentiful storage space were vital for this Ducato upfit. The Syncro System engineers designed the upfit remaining faithful to the company's unique set of needs. First, the cargo's interior: paneling for the walls and resin-coated wood for the floor. Both water resistant and easy to clean. Along the right side wall, we created a practical workspace: first we installed a wheel arch frame with a front door panel, creating out-of-the-way storage for the upfit's 2 12-Volt/100A - powering the van's 600 Watt inverter, which generates electricity from 220 Volts. On this base, we added a shelf on which we mounted a small battery-powered refrigerator and a drawer unit with four drawers. On the top, we mounted a spacious, resin-coated wooden worktop, complete with raised borders on the sides. Next to this, we installed a sink kit with an electric water pump that draws water from a 20 litre water tank underneath it. The left-hand side is dedicated to creating ample space to secure and transport various materials and equipment. 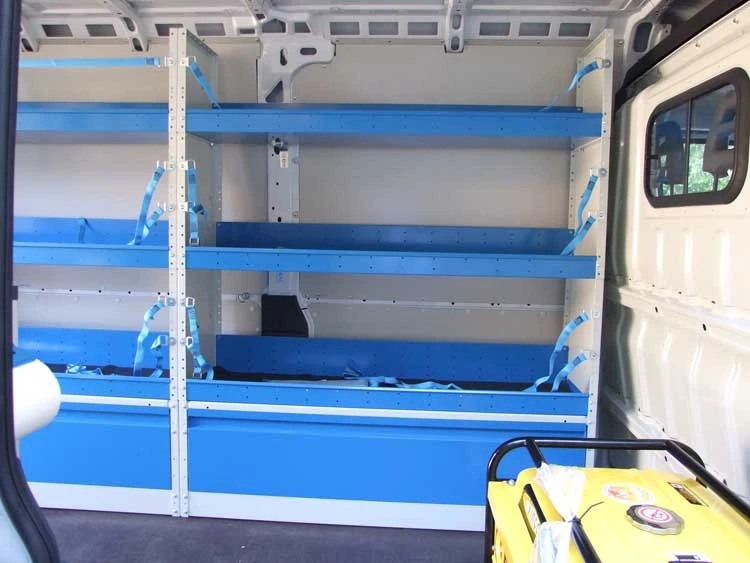 The racking unit covers the entire left wall; it is comprised of two closed wheel arch frames and six shelves, creating spacious storage areas with safety straps for secure transport. 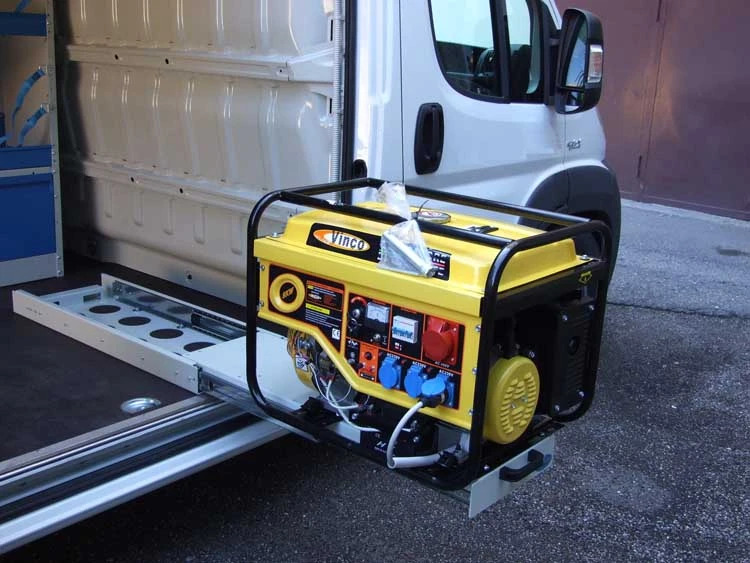 The van produces all the electric energy it needs: a 5.5 Kw gas-powered generator fixed to a slide-out base, accessible from the side door. 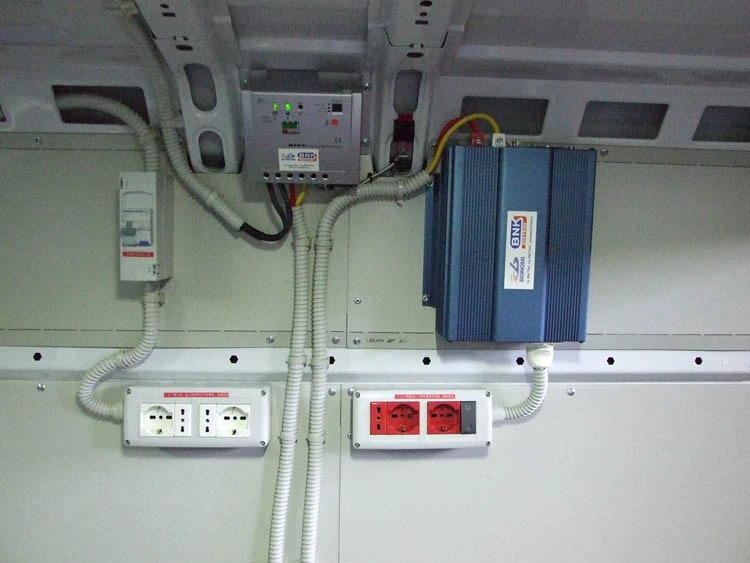 Sockets situated above the work space make it easy to plug in a variety of appliances and equipment simultaneously. 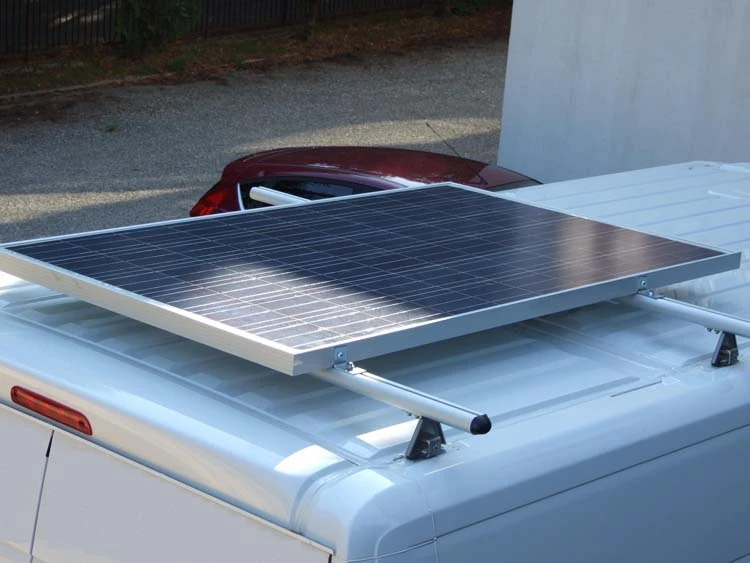 An innovative addition to this upfit is the solar panel, fixed to the SuperSilent Syncro roof rack. 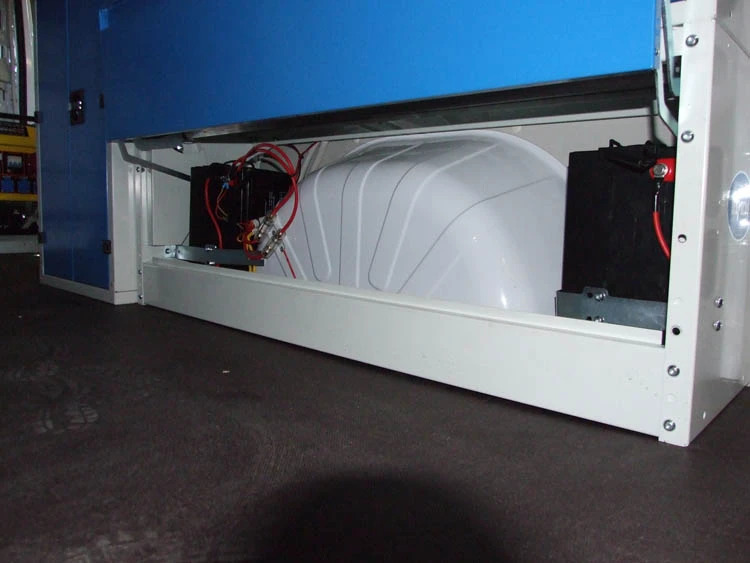 Thanks to the PV system and the MPPT device, it was possible to equip the van with alternating electric voltage used for charging the batteries and powering the van's two LED lights.